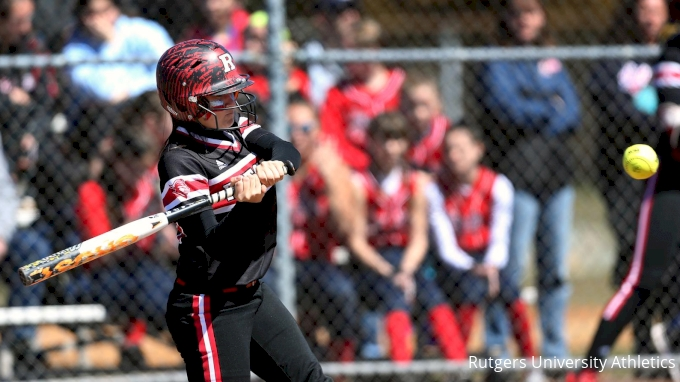 Rutgers softball (20-19, 4-8) used shutdown pitching and timely power to score 3-0 and 5-3 wins over Penn State (20-24, 4-10) in a Saturday doubleheader to sweep the Big Ten series at the Nittany Lions Softball Park and Beard Field. The Scarlet Knights sweep a Big Ten series for the first time since taking three against Indiana at home April 22-24, 2016. This is Rutgers' third Big Ten series sweep since joining the conference in 2015. It's the first sweep against Penn State as Big Ten opponents. Now at 20 wins on the season, Rutgers has already surpassed last season's win total with 12 regular season games to play.